Description: The studies (seven articles in English and two in German) presented in this volume will give some insight into Luke's way of dealing with certain literary traditions available to him and to his audience. They try to determine something of the relation between the Luke-Acts in general or a special passage in particular and the biblical associations in his Hellenistic environment. Such is the limited goal of this collection of essays; nothing more, nothing less. If one theme should prevail in this volume, it might be the connection between interpretation of Scripture and the phenomenon of dreams. In some of the articles, the author deals quite explicitly with the combination of dream and Scripture, in others only with the interpretation of Scripture. When dealing with the interpretation of Scripture in other articles, the connection with other types of divine communication is sometimes mentioned in passing. The essays collected here help readers find their way through the endless fabric of Luke's interpretation of the events concerning Jesus and his disciples in the light of biblical and classical wisdom traditions. 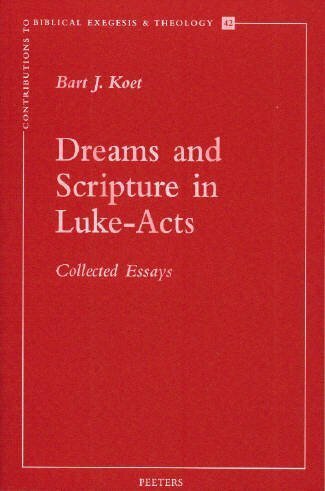 Citation: David L. Tiede, review of Bart J. Koet, Dreams and Scripture in Luke-Acts: Collected Essays, Review of Biblical Literature [http://www.bookreviews.org] (2008).